During southern hemisphere winter in 2005 I was working in a Bolivian village. One weekday morning the church bells starting ringing. The only other time that had happened, a building was on fire and we assumed this was the case. Some of us went out to see what was up. Turns out a young man from outside of the community had been caught trying to break into someone’s house. He was locked in a closet and the community was trying to decide what was to be done with him. There was talk of lynching him. As hard as it was to believe that our friends and coworkers might actually lynch this poor kid, several other lynchings had taken place in Bolivian villages right around then. Thankfully, the kid wasn’t lynched: I think that the higher-ups in the community fully realised that such a move would be bordering on insane for so many reasons, not the least being that the place is a tourist attraction and nothing discourages tourism like beating a kid to death and setting him on fire. As far as I know, the kid was handed over to police who drove in from La Paz. Thus it didn’t really surprise me to find out that two men were lynched in the village of Quila Quila this year after allegedly being caught ‘red handed’, stealing colonial paintings from the local church. Before I continue, I’m not going to put any links to news stories here because they are all filled with photos of dead bodies. Google at your own risk. Quila Quila is home to less than 200 people and, although it is only 40 km from the city of Sucre, it is difficult to get to. Although not particularly high for Bolivia, at 2,582 m above sea level, one has to leave the main road and eventually cross a river which is often flooded to get there. On Sunday 6 March, 2012, residents of the village of Quila Quila noticed three strangers in the village. Some reports say that the men attended mass in the morning or were seen in the church which was opened on the Sunday, but I have been unable to verify this (or verify that the Quila Quila church even has regular mass). Clearly this was suspicious and the community placed the church under observation. Sometime in the night, two of the men were caught coming out of the window of the church. They had allegedly removed paintings and metal objects from their usual spots, and in the pocket of one man there was allegedly a stolen item and a gun. The community took the men into custody early Monday morning. At some point a member of the community was able to contact the police in Sucre and informed the authorities that the two men were about to be lynched. This call was either made by or confirmed by the pastor of the village (if he does exist, that would support the idea of a Sunday mass), who urged the community members to hand the suspects over. Police officials attempted to reach Quila Quila that day but river flooding prevented access. Meanwhile what little contact was made with the community did not produce any confirmation that the suspected thieves were safe. At 4 am on the Tuesday the authorities again tried to reach Quila Quila. News reports indicate that around 80 or 90 police officers, officials, and others were deployed. At the previously flooded Cachimayu bridge, motorcycles were lowered by ropes and an advance team headed towards the entrance of the community while the rest proceeded on foot. At 10:30 am they reached the entrance to the village, which they found was blockaded by the villagers. They negotiated with the villagers at the blockade for a few hours and eventually learned that the suspected thieves had been killed. Upon promising that community members would not be prosecuted and, interestingly, that they would investigate the theft in order to find the suspected 3rd thief, the villagers told the police what happened and where the bodies could be found. 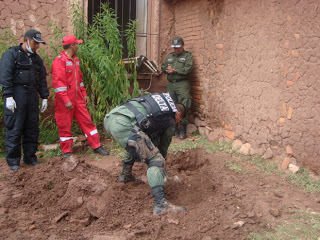 In a shallow grave behind the church, the police exhumed the bodies of Severo Higueres Cruz of Potosí and Pablo Vilasaca Pallehuanca of La Paz. An autopsy confirmed that the men had been handcuffed, beaten, and stoned and had died of manual strangulation. Yesterday I did a quick news search of lynchings in Bolivia. In a half hour I found 7 lynchings this year, not including the Quila Quila lynching. Everyone kinda halfway talks about lynchings in Bolivia, especially in relation to community justice systems and, especially, Indigenous community justice systems. In 2009 when the new constitution came into effect, publicly sanctioned community lynchings were presented as the possible horrible outcome of a move towards decentralized, cultural justice systems. That didn’t happen, thankfully, and the government constantly says that community justice doesn’t get to include lynching, but that doesn’t mean that this is not a cultural phenomenon and, of course, that it isn’t a possibility in the case of ‘caught red handed’ theft. While this is the only case that I know of where alleged cultural property thieves were lynched, it is also the only one that I know of where the thieves were caught in the act by villagers. In a way, this was the only case where a lynching could occur and it did occur. It seems like under similar circumstances (remote village, no police presence, red-handed church thieves), a lynching might happen again. Theft is, I am told, considered to be really quite serious in Indigenous communities and theft from the community is probably considered even more serious. 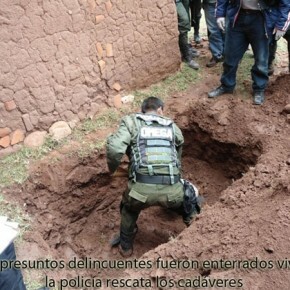 I have a pile of academic papers on lynching in Bolivia to read over regarding cultural and social motivation so I won’t start speculating on that now, but this has to be seen as a real possible outcome of an attempted theft of cultural property in Bolivia under certain circumstances. Such things are so difficult to approach objectively through the lens of my own cultural sense of morality and justice. I’ll let you know how reading the papers goes.